Submitted by Alexander Briones on Mar. 26, 2018. Originally published on Jul. 19, 2017 and last updated on Mar. 27, 2018. Building your very own personalized guitar has never been this easy, thanks to DIY (Do-It-Yourself) guitar kits. Here we take look at the best of what the market offers, updated for 2018, covering most of the popular guitar styles and configurations. 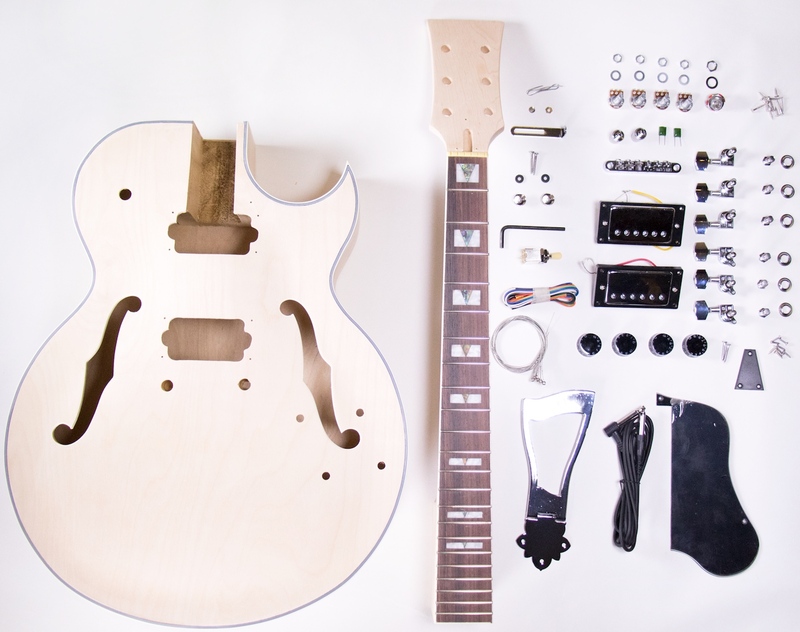 Thanks to these affordable guitar kits, you can now build your own guitar without having to craft body parts from wooden tables and planks. Unlike Brian May and his dad, who built the iconic "Red Special" guitar from wooden tables and planks - all you have to do is order a guitar kit online, and you are free to assemble and customize as you prefer. These guitar kits reduce the skill and cost requirements of guitar building considerably, making for great entry points into lutherie and guitar modification. 82 out of 100. Incorporating 70+ ratings and reviews. The Pyle-Pro PGEKT18 is a DIY guitar kit that follows after the venerable Stratocaster, allowing you to custom build your own instrument without spending very much at all. 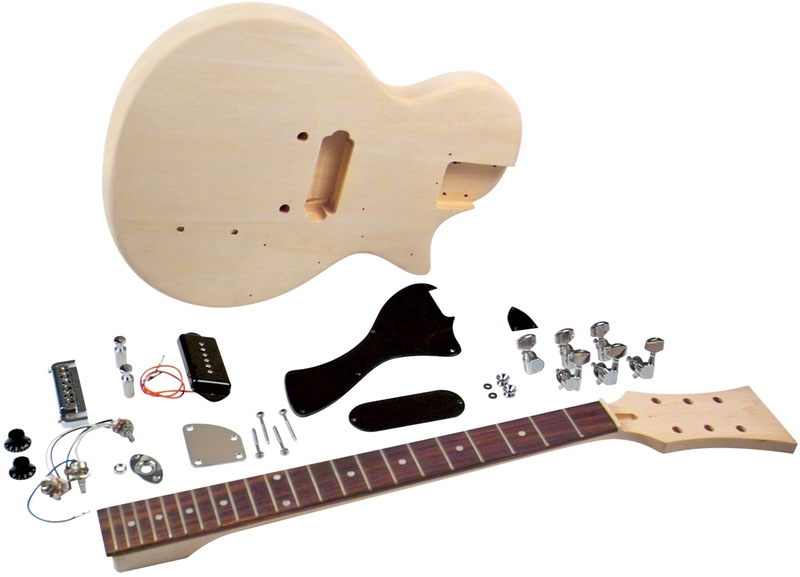 There's nothing out of the ordinary with this kit, but it does include everything you need to build the guitar, including the basswood double cutaway body, bolt-on maple neck, rosewood fingerboard and a set of hardware/electronics. All you have to do is bring your creative side to the building process and given the price, it may require some patience and research. Note that the included pickups are colored white, matching the pickups to the knobs. While there are differences in opinion with regard to its quality, many agree that it is good enough for the money. The customizable headstock gets a lot of thumbs up, as well as the quality of the neck wood. There were a few who had issues with the hardware, specifically the nut, but most were happy with the result. The Pyle-Pro PGEKT18 is a good starting point for future luthiers and hobbyists alike. 80 out of 100. Incorporating 20+ ratings and reviews. 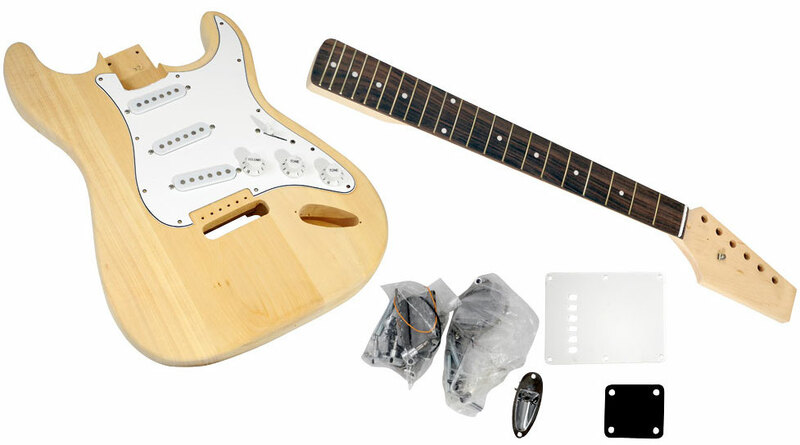 Here's another DIY guitar kit that lets you build and customize your own Stratocaster style guitar without much effort. It comes with a double-cutaway basswood body, maple neck and headstock, all of which are pre-drilled, so you can focus on working on your desired finish, instead of having to worry about routing. The electronics are also pre-soldered, so ideally there's no need to solder anything, but it is still wise to have a soldering iron ready in case some of the wires are loose for whatever reason. Since the neck is bolt-on, you'll need a screwdriver to get it attached to the body. The AXL DIY S-STyle kit is commended for its value for money and easy build. A number of users found it to be a great starter kit, especially with its well-sanded body. There are some who report that the package does not include an instruction manual, thankfully, you can find the contents of the manual online. There are a few report of missing parts, but they are able to get a replacement for the parts and finish their build. The AXL DIY is a good beginner electric guitar kit for those who just want to play around with colors and decals, and don't want to drill into wood or solder wires just yet. 78 out of 100. Incorporating 10+ ratings and reviews. The Seismic Audio SADIYG-02 is based on the iconic Telecaster electric guitar. It comes with a single-cutaway body that's crafted from paulownia, a China native wood that's known for being light. The pickguard is already set into the body when you get the package, but you'll need to solder the input jack, the volume and tone knobs, the bridge pickup and the selector switch before you start using it. The headstock does not come pre-carved, which is good for those who want to personalize its shape, and bad for those who can't do wood work. All needed parts are included, along with hex wrenches for the truss rod and saddle adjustment, it even comes with some solder, so you'll just need a soldering iron and a Philips head screwdriver to complete the assembly. Many are happy with the Seismic Audio SADIYG-02's ease of assembly, and overall quality after being built. Playability and sound quality is considered to be good enough for the price. There are some who are not too happy with paulownia wood for the body, citing that it scratches and dings easily. Others report imperfections in the frets and sanding. 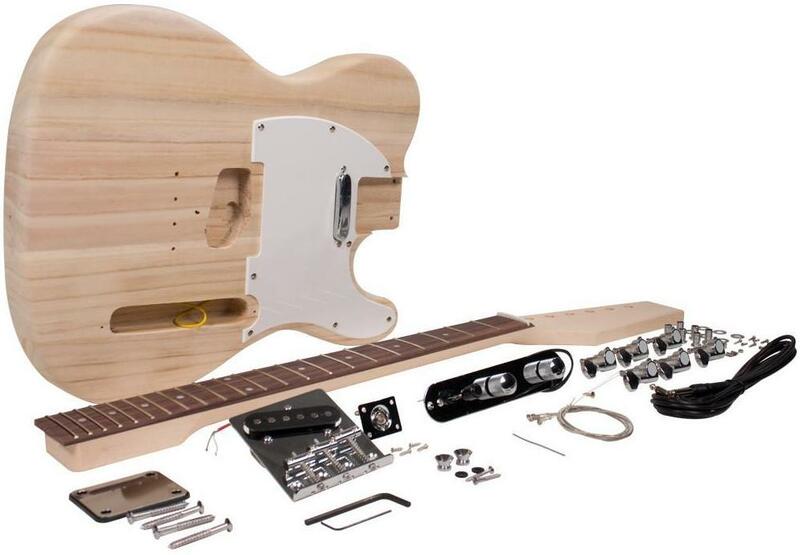 Check out the Seismic Audio SADIYG-02 if you're looking for a Telecaster style guitar kit. Based on the popular Les Paul Jr, the Saga LJ-10 DIY electric guitar kit follows after its streamlined aesthetics and electronics. It comes with the popular LP style body, crafted from basswood and pre-drilled for complete assembly. It has a bolt-on neck that you have to screw into the body, and a headstock that you can carve into your preferred shape. Finally, it comes with a single P-90 style single-coil pickup, which is already pre-wired into the body, so you no longer need to do any soldering, unless you want to make changes into the circuit. Most users are happy with what they got for the money, from its wood quality, to the included hardware and electronics. As expected, many of its buyers are fans of the Les Paul Jr who want to try their hand at customizing their own straightforward rock machine. Surprisingly, there are some who are happy with its default configuration, including the feel of the neck, the sound of the P-90 pickup and the quality of the tuners. There are some reports of imperfections in the body, but they were able to get the fixed or at least hidden via paint. The Saga LJ-10 is a good quality electric guitar kit, even if you're not a fan of the Les Paul Jr.
84 out of 100. Incorporating 20+ ratings and reviews. As the name implies, TheFretWire DIY 175 kit is based on the popular ES-175 hollow body guitar, following its shape and configuration, but using more cost effective materials. More importantly, it lets you customize your own archtop as you prefer - you can make it into a classic jazz box, or add some cool paint jobs to turn it into a rockabilly style instrument. The body is pre-drilled and crafted from basswood, while the maple neck is meant to be glued into the neck joint, something that requires a bit of care and precision. Because of its hollow body design, installing electronics can be a bit of a challenge, but very doable as attested to by reviews. Note that wood is raw and unfinished, so you'll need a bit more sanding and patching before you paint on it. Even with its harder than usual build requirements, those who built this kit have mostly nice things to say about it. Many of them are impressed with the precision of the neck joint, while others are happy with the overall quality of the wood and hardware. Experienced builders recommend utilizing better wires and replacing the pickups to get the best result. If you're looking to customize or build your own hollow body electric guitar, then check out the TFW (TheFretWire) DIY 175. The whole point of having a DIY guitar kit is to build a guitar that you like, so make sure that you get one with you're preferred shape and profile. Kits with classic guitar body shapes are the safest choice, as evidenced by their continued popularity in the market. But don't limit yourself with just the familiar, spend time looking at other designs to see if you're missing out on something cooler, something that better matches your personality. While we did our best to pick only top-rated kits, we know that in our less-than-ideal world, things can and will go wrong. So it is imperative to check wood quality and the alignment of the pre-drilled holes. It is the first thing to do if you have just received your DIY guitar kit from an online retailer. Compared to building something from scratch, the kits listed here are relatively easy to work with. Still, there are some that require more patience and experience, like those with set-necks and hollow bodies. On the flipside, there are kits that make life easier for you with their no-soldering required electronics and bolt-on necks. It is recommended that beginners go for easier builds, but with so much information available in the internet age, it should not hinder you from getting what you really want - just make sure to be patient and do your homework. Before taking the plunge, make sure that you have the necessary tools to build the guitar of your dreams. Most kits will require you to have screwdrivers, pliers and soldering iron for the assembly process. While others require more, like wood glue, bandsaw and other wood routing tools. Once you've decided on the finish, you'll also have to get finishing tools like sandpaper, wood sealant, primer, paint and more. It is also recommended to have a dedicated room or space for you to work on, a nice working table would also make work a bit more easier. No matter how we try to dodge the reality of mass production, at the end of the day, you will get what you pay for. So it is best to consider possible hardware upgrade options that will improve tone and playability. Most reviewers got great results by swapping out the bundled pickups, while others opted to replace the tuners and nut. At the onset, we decided to stick to DIY electric guitar kits that can be bought from online retailers in the mainland US, to ensure that the ones we list are accessible. We then took note of popular and highly rated kits, which for this updated required us to gather around 700 relevant user and expert reviews and ratings. All these data are then fed into the Gearank algorithm, which gave us the scores that allowed us to narrow down the list to just the top 6 kits. For more information about this process see How Gearank Works. Submitted by Ralph Gleeson jr (not verified) on Mar. 10, 2018. Can u get the amino flying v kit with block inlays in the neck and is it set neck or bolt on? Thank u.. Submitted by Jason Horton on Mar. 13, 2018. It seems that the Ammoon Flying V kit is sold out - I had a look around but couldn't find any Flying V kits that are available at the moment. Submitted by Jason Horton on Mar. 26, 2018. Submitted by Lee Taylor (not verified) on May. 10, 2018. For reviews and building tips I suggest the you-tube channel Guns and Guitars. He's built quite a few kits and also shows how to make some helpful tools that can save a few bucks.